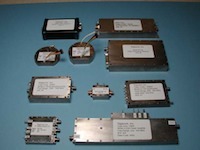 Gigacom, Inc. manufactures a number of RF and microwave products, many to support the U.S. military. Our engineering staff has extensive experience in designing RF and microwave circuits covering the low HF to X and K microwave bands. Most of our designs are built to withstand the rigors of flight, both manned and unmanned. Products include transmitters, receivers, power amplifiers, transceivers and synthesizers. Our product line is continually expanding. If you are unable to find a product on the website that meets your needs please contact info@gigacom.org. Many of our products were requested by U.S. Military Test Range personnel. Gigacom, Inc. also provides engineering consulting services. Our team of engineers is proficient in RF/Microwave, digital, DSP, power supply and mechanical design. If you need a new product designed or need help on an existing product please call us.